Summer, but a few short months, is the shoulder upon which balances the scale of seasons. Long overdue from what is often a wet and gray stretch of time where both the light of day and individual temperament are measured in how low or high the sky appears, and meals are measured in their ability to satiate and soothe both hunger and unrest, it is Summer that ties together the two disparate sides of the palate for me: savory and sweet. It’s not that my ideal of Fall, or the anticipated revelry of Winter disappoint, it’s simply that summer brings a bounty of fruit with her arrival that is unmatched at any other time of the year. It’s this abundance of sweet, delicious, sun-ripened fruit that cajoles me into dessert making and oven baking beyond my own palate’s natural desire. Perhaps it’s the artistry that fruit inspires; the broadened palate of flavor that fruit delivers; or, the versatility and delicate balance that fruit so generously offers. Whatever the rationale for this evening of allegiance, abundance is the intoxicating tipper. For it is Summer that brings an overwhelming bevy of berries, big and small; a preponderance of stone fruits that amass in greater quantity and variety with each and every season; and, of course, favored gems that garner their own level of acclaim and fanfare. Fresh, ruby-red cherries, sweet or tart, or those delivered with sunshine hues in the form of Rainiers, fall in this latter category of “gems.” Eagerly awaited and gone far too quick, cherries are a summertime favorite. Though often popped in a variety of sweet offerings, they are equally as brilliant in savory ones as well. 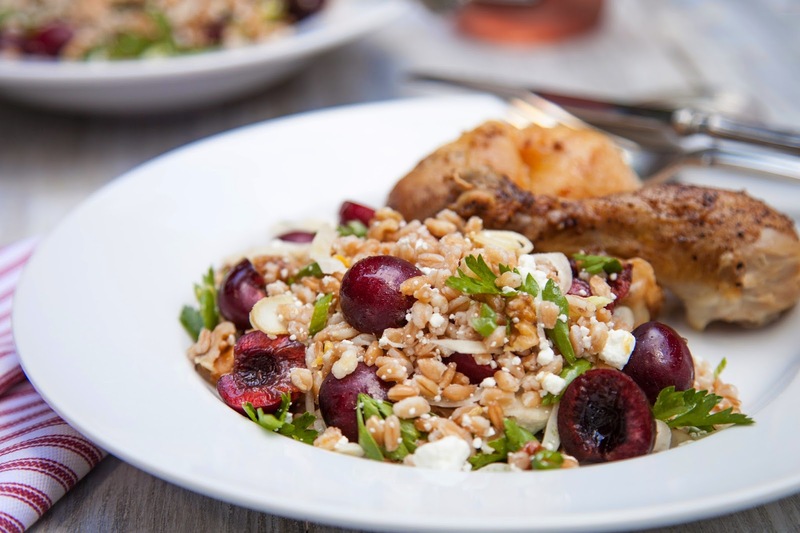 In this simple summer salad, plump fresh Stemilt cherries impart a much-appreciated subtle bit of sunshine in an easy farro salad that can be served up alone, alongside a beautiful deli-roasted chicken for an easy no-fuss meal, or melded together with poultry for a wonderful one-dish serving. 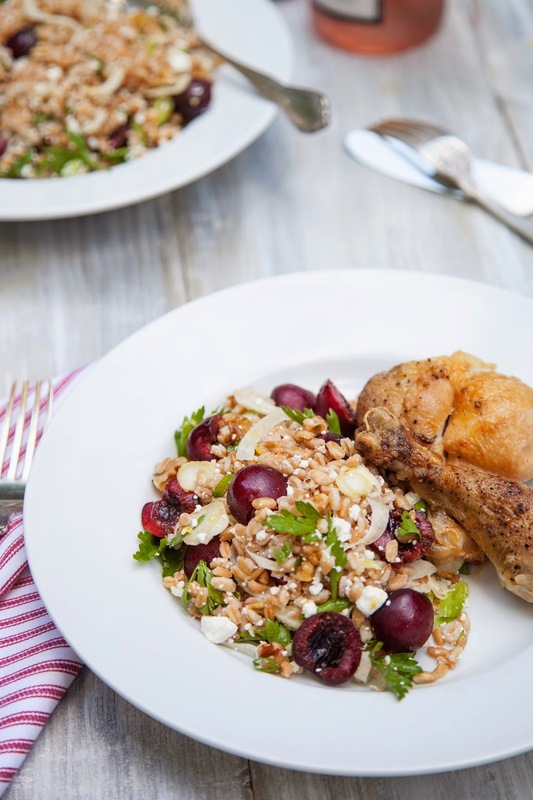 This sweet fruit imparts a lovely balance of flavor between the nutty, satisfying farro, the delicate bite of thinly sliced fennel and green onions, the appealing crunch of chopped walnuts, and a refreshing pop of fresh Italian parsley and lemon zest… all melded together with a light, lemon-vinaigrette. It’s a perfect sweet and savory balance… a simple plating that sits between the limitations of Spring and the forgotten bounties that mark Fall’s arrival. For recipe details, visit Stemilt’s blog, The Stem.